As the media marks the death of Margaret Thatcher with blanket television coverage looking back at her time in office some familiar images are brought back to mind. But sometimes it’s hard to disentangle the memories: which of the images am I really recalling from the 1980s? In the case of the images of the 1983/4 miners’ strike, the boundaries between news footage and re-enactment are very blurry in my head. I remember the strike very well; I remember the marches and the benefit gigs, I remember throwing money into collection buckets every day on my way to and from work, probably with a ‘coal not dole’ badge on my coat, and I remember the news reports. At least, I think I do. But there’s a distinct possibility that some of that memory is somewhat second hand. 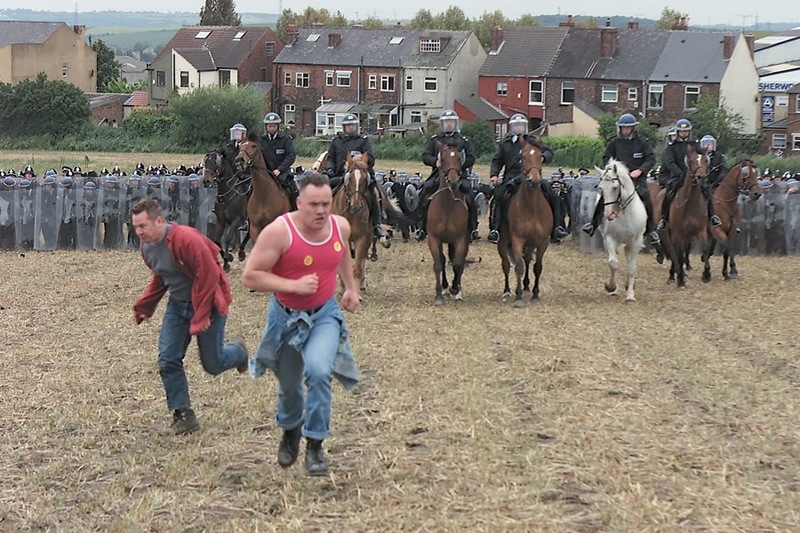 The images of Orgreave that are so clear in my mind come not just from the news reports of the time, shocking though they were, but also from Jeremy Deller’s 2001 re-enactment of the event, filmed by Mike Figgis. Deller worked with both historical re-enactors and local people – including former mineworkers – to restage the clash; Figgis filmed the event and interviewed some of those – from both sides – who were there on 18 June 1984 when striking mineworkers on the picket line outside British Steel’s coking plant at Orgreave, South Yorkshire clashed with the police. Deller’s reenactment is interesting not just as an attempt to understand what happened at Orgreave and the on-going implications of the miners’ strike and Margaret Thatcher’s war against the trade unions – and the interviews with people on both sides of that day’s events pepper Figgis’s film are fascinating – but also in referencing the culture of civil war re-eactment that sees thousands regularly spending their weekends re-staging past battles in the English countryside. Here the costumes may be different, and the involvement of local people, including former mineworkers, adds a layer of authenticity impossible to achieve when re-staging battles from centuries ago, but the activity is, essentially, the same. I’ve never understood the attraction of re-enacting civil war battles; apart from anything else, I prefer my leisure activities to involve fewer costumes* and less mud. In this case though, I get it. * No costumes at all. I really don’t do dressing up. 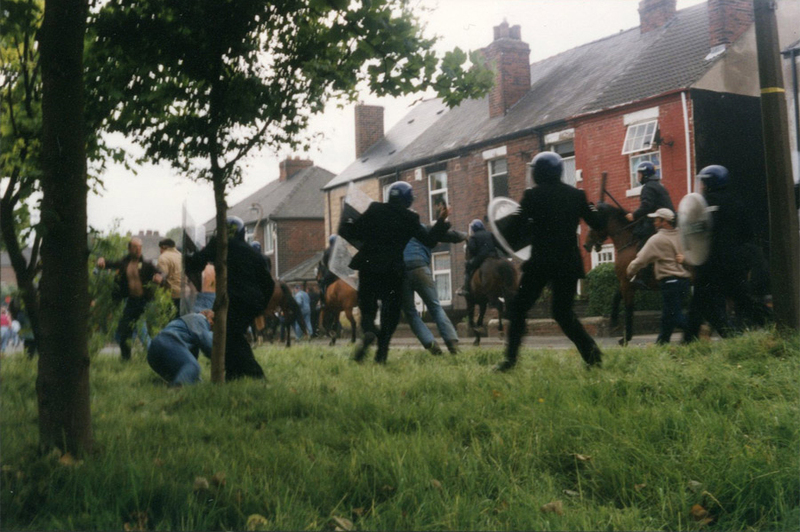 This entry was posted in Film/Video, Intervention, Performance, Photography, Politics, Public Art and tagged art, Artangel, film, Jeremy Deller, Margaret Thatcher, Mike Figgis, miners strike, politics, re-enactment, The Battle of Orgreave by Ann Jones. Bookmark the permalink. Ann Jones, an art teacher and blogger, is writing about the influence of Thatcherism on the arts In a really interesting informative way. So far she has looked at the famous “Gone with the Wind” poster that I had on my wall all throughout the 1980s along with my Clash and Smiths posters, And here she looks at Jeremy Deller’s re-enactment of the battle of Orgreave: a violent confrontation between police and striking miners in the Village of Orgreave in 1984. 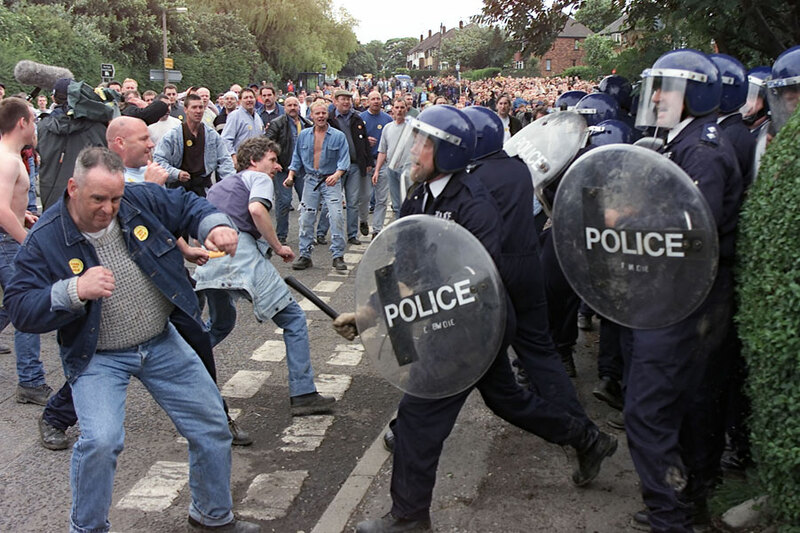 The incident was a key turning point in the strike, because it highlighted the extent of the politicisation of the police (miners said they were ambushed), and the violence that the government were prepared to use in order to break the strike (along with a sustained campaign against the strike from an acquiescent media). Looking back, it’s more surprising that the miners managed to sty out for so long (over a year), sustained mainly by the union, sympathetic lefties all over the country, and the women in the mining communities campaigning,organising, and coming together to support their families. This is so something that is often forgotten about the strike, where the fundamental basis of society: families and their neighbours, were threatened. Many of the police officers in the reenactment and the original incident were from mining communities. Like the Civil War, this strike pitted neighbour against neighbour, and tore families apart (those who returned to work, scabs, were ostracised, despite often being as desperate as their neighbours). This is what I think of as Thatcher’s legacy. However, Boy George once said something along the lines of the best art coming out of repression, and the level and quality of the art and music coming from the margins of society has never been bettered.